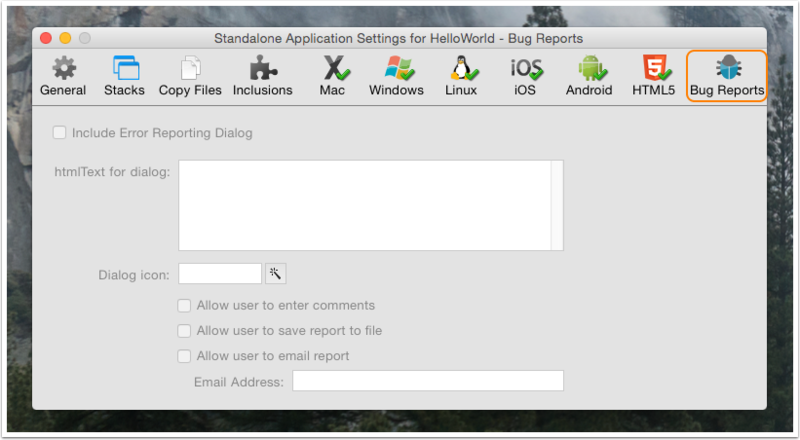 The Standalone Applications Setting dialog allows you to create settings for your standalone application. This dialog can be found in the File menu. The settings you enter are applied to the current front most editable stack and are saved with the stack. This means you only need to enter the settings once for each application you create. The same settings will apply if you do another build in the future. The General Settings pane allows you to set the top level properties for your standalone. 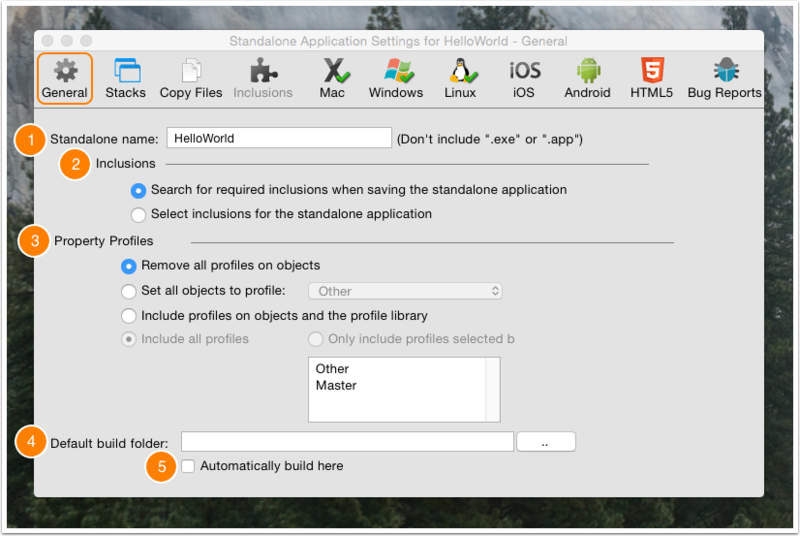 Standalone name - Set the name of your standalone application. This should be the name you want your finished application to have. 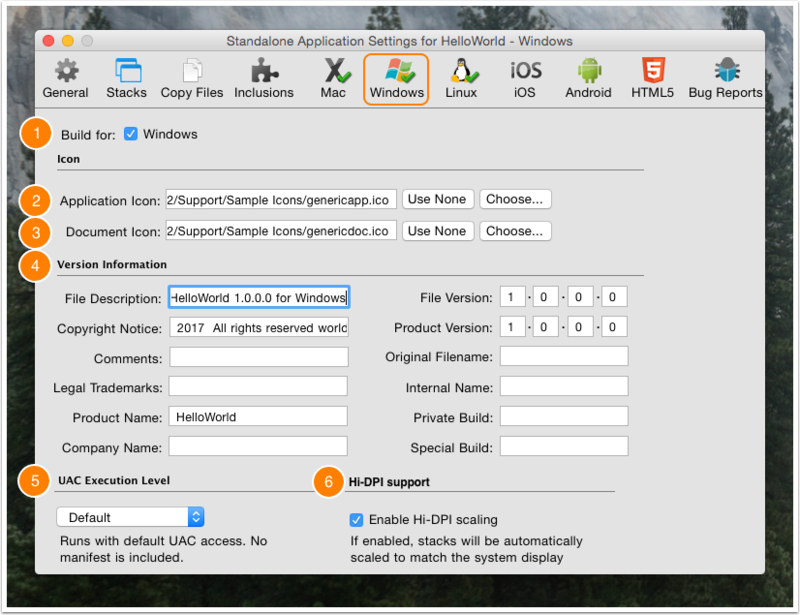 Don’t include a file extension (.exe on Windows or .app on Mac OS X) as the standalone builder can create standalones for multiple platforms and will add the appropriate extension automatically. Inclusions selector - Choose the components you want to include in a standalone. You may either choose to search for required inclusions automatically, or manually select the components you want to include. Search for inclusions - This is the default option. When selected, LiveCode will search your application stack file (main stack and sub stacks) to attempt to determine what components your application uses. It will then include those items. Select inclusions - Select this option if you want to specify the components to include manually. You may wish to use this option if your application dynamically loads components that cannot be searched at this point automatically, or if you know exactly what components your application uses and wish to speed up the standalone building process by skipping the automatic search step. It is important that you choose to include all the components that your application uses or it may fail. Remove all profiles on objects - Removes all profiles and builds the standalone using the currently active profile on each object. Select this option if you don't need to change profile in the standalone and want to save disk space by removing extraneous profile information. Set all objects to profile - Set all objects to a specific profile then remove the profile data from objects. Include profiles on objects and the profile library - Include the profile library and allow switching between profiles in the standalone application. You can choose whether to include specific profiles or all profiles. Default build folder - Set the folder the standalone will be built in. You can choose to automatically build to this folder every time the standalone is built (5). 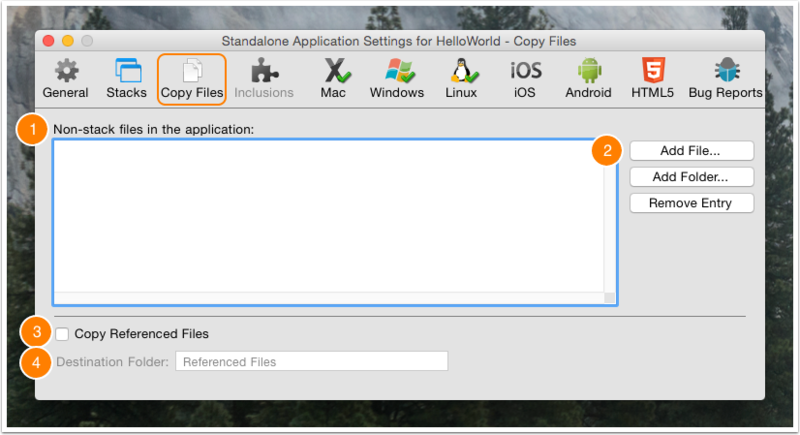 Use this section to add additional stack files to your application. Any stacks you add to this section will be added to the stackFiles property of the main stack of your standalone. This means that any scripts within your standalone application will be able to locate and reference these stacks by name. Advanced Options - Use this section to control exactly how multiple stack files are managed in your standalone. 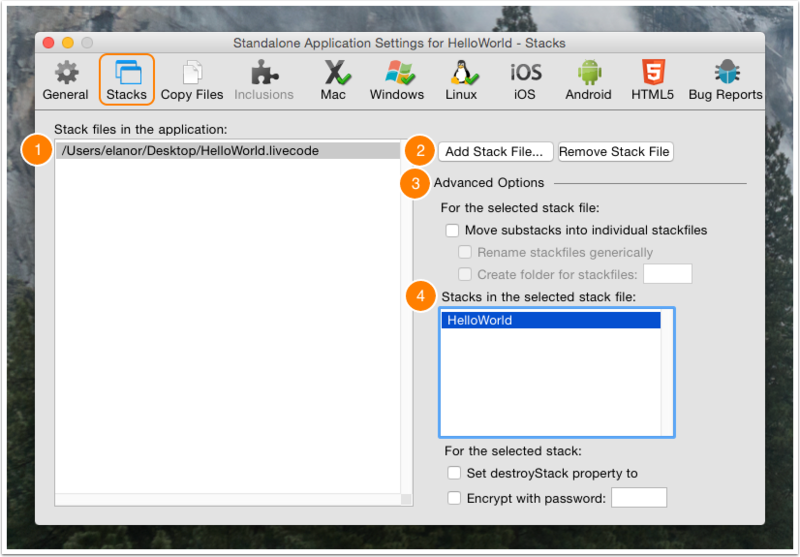 Move substacks into individual stackfiles - If you select this option, each of the sub stacks in the stack files you select will be moved into their own individual file, located in the data folder or within the application bundle of your standalone. Rename stackfiles generically - Renames each sub stack file using a number on disk (instead of using the name of the sub stack). Select this option if you do not want the names you have selected for stacks to be visible to the end user in the filing system. Create folder for stackfiles - Creates a folder and places the stack files into that folder, instead of storing them at the same level as the standalone executable. All references in the stackFiles property will refer to this folder using a relative path so the stacks can still be located by the standalone application. Individual stack options - Select a stack file on the left then an individual stack from within the file to set options on that stack. Set destroyStack to true - Set this option if you want the selected stack file to be removed from memory when it is closed. This option is useful if you are loading large stacks into memory and want them to be removed when they are closed. Encrypt with password - Secures the scripts within the selected stack file with a password. This provides a basic level of encryption that prevents someone from casually reading the scripts in the stack by opening the file in a binary file viewer. Note: If iOS or Android are selected in the Standalone Builder settings, the Stacks pane is grayed out. To work around this and password protect a stack, or add stack files, uncheck iOS and Android, check any desktop platform, and make your changes. Then uncheck desktop and recheck iOS or Android to build your standalone. Use this section to add other files to be included in the standalone, this could be images, sound files, fonts etc. List of files - List other files to be included in the standalone. Use this feature to include help documents, read me files and other resources that you want to include with your standalone each time you build. Buttons to add files, add folders and remove entries from the list. Adding a folder adds the selected folder and all its contents. Copy Referenced Files - Loops over all image and player objects in stacks and copies any files referenced in the fileName property of these objects into the standalone then automatically sets the fileName property of these objects to reference these files in the standalone using referenced file paths. Destination Folder - Create a subfolder within your standalone to copy the image and move files to. The list of resources available to select for inclusion in a standalone application are a combination of currently installed LiveCode Builder extensions, externals and database drivers (both built-in and those found in user folders), and built-in resources and script libraries. If you selected "Select inclusions" in the General section you use this section to select the widgets, libraries and externals to include in your standalone. This section allows you to set the Mac specific settings for your standalone. 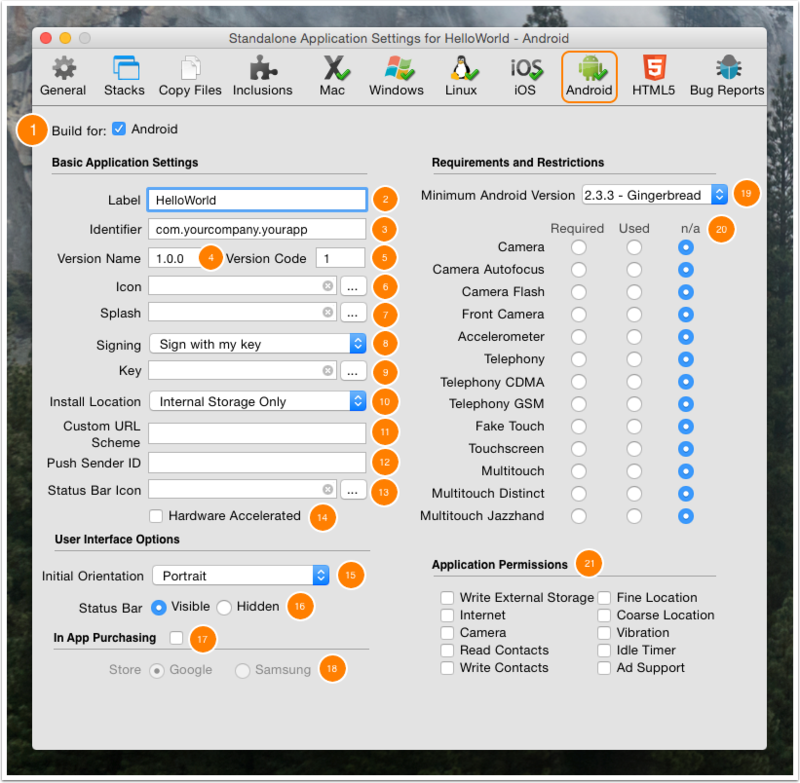 Build for Mac OS X 32-bit - Build a standalone that will run natively on Mac OS X Intel machines. This standalone will not run at all under PowerPC. Build for Mac OS X 64-bit (EXPERIMENTAL) - Build a standalone that will run natively on Mac OS X Intel machines. This standalone will not run at all under PowerPC. Application Icon - Choose an application icon to represent the application in the Finder. The icon should be in icns format. Document Icon - Choose a document icon to represent your application's documents in the Finder. The icon should be in icns format. Icons for ask and answer dialogs - Choose an icon to display whenever you use the ask or answer commands to display a dialog. On Mac OS X, the convention is that these dialogs should display your application icon. The icon should be stored in your stack as an image, or selected from LiveCode's built-in icons. If you have used a built-in icon, be sure to select the relevant inclusion on the General tab (if you are selecting inclusions manually). 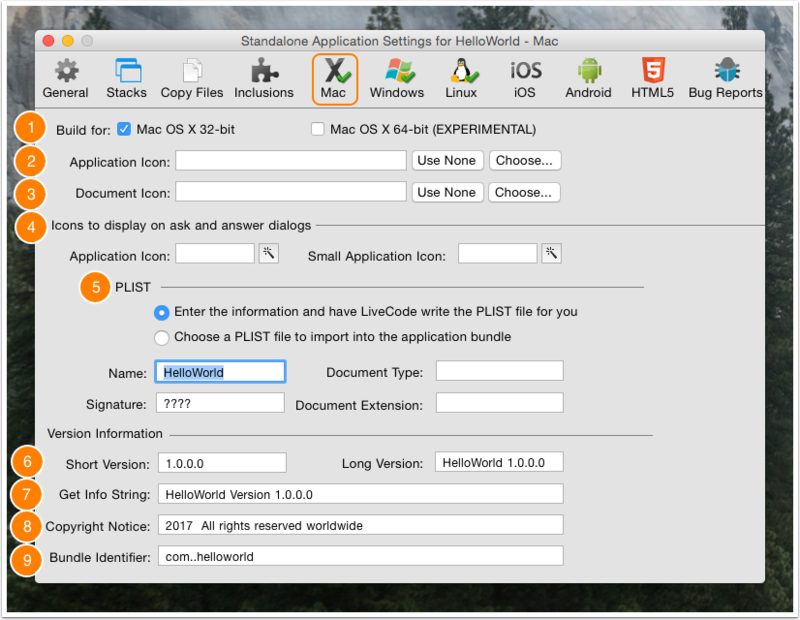 PLIST - The PLIST is a settings file stored in XML format as part of every Mac OS X application. It contains information about the application, including its name, version number, copyright notice and document associations. Enter information and have LiveCode write the PLIST - Have LiveCode fill out the PLIST for your application automatically. Having LiveCode create this file for you is the recommended option. For more information about PLISTs consult Apple's developer documentation. Choose a file to import into the application bundle - Choose to import a PLIST file instead of having LiveCode create one. Select this option if you have created your own highly customized PLIST that you want to use for your application in each build you create. Short/Long version - The version information to be included with your standalone. Get info string - The visible text displayed in your application's Get Info window by the Finder. Copyright notice - The copyright notice for your application. Bundle identifier - A unique identifier for your application used by Mac OS X to identify your application. This section allows you to set the Windows specific settings for your standalone. Build for Windows - Check to build a standalone for Windows. Application Icon - Choose an application icon to represent the application in Windows. The icon should be in .ico format. Document Icon - Choose a document icon to represent your application's documents in Windows. The icon should be in .ico format. Version Information - The version information to be stored as part of your application and displayed in the Windows property inspector and dialogs. Hi-DPI support - Check to enable Hi-DPI scaling, stacks will be automatically scaled to match the system display. This section allows you to set the Linux specific settings for your standalone. Include - Select built-in LiveCode dialogs to include. These dialogs are useful if your application may be run on a system that does not include these dialogs as part of the OS. You do not need to include these dialogs if you are running a recent version of GTK. This section allows you to set the iOS specific settings for your standalone. Build for iOS - Check to build a standalone for iOS. 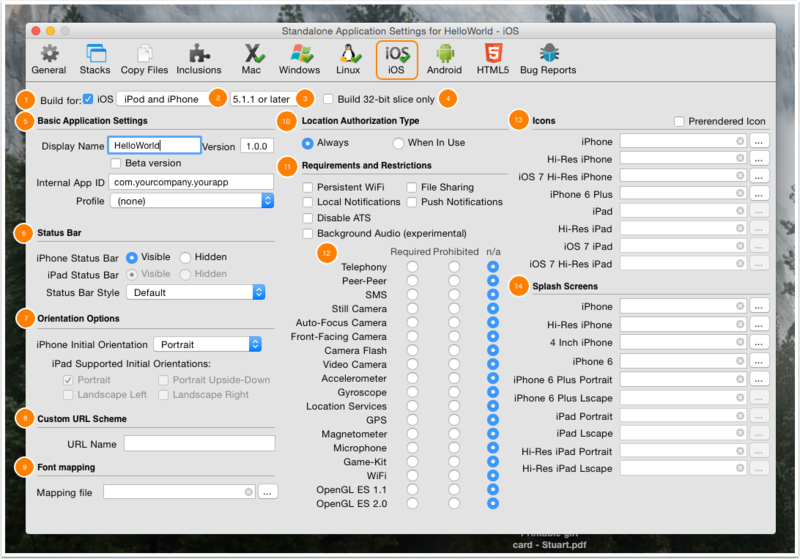 Supported devices - iOS uses this to determine if an application should launch on iPod/iPhones and whether it should run in iPod/iPhone emulation mode on iPads (UIDeviceFamily). Minimum iOS version - The minimum iOS version required by the application (MinimumOSVersion). Display Name - The string to display as the label of the application on the SpringBoard (CFBundleDisplayName). 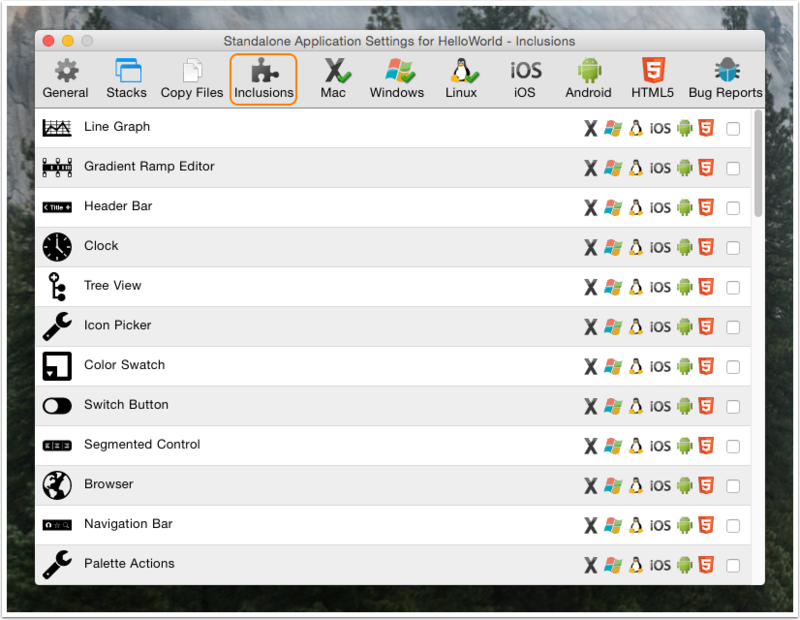 Version - The version of the application (CFBundleVersion). Beta version - Check to mark the version as a beta(test) version. This is used with Testflight. Internal App ID - The bundle identifier to use for the application, in conjunction with the App ID present in a provisioning profile. This uniquely identifies an application (CFBundleId). Profile - The provisioning profile to use when building the application to run on a device. iPhone Status Bar - visible or hidden (UIStatusBarHidden). iPad Status Bar - visible or hidden. Custom URL Scheme - The custom URL that allows the app to be woken up when the URL is selected on a device. Font mapping - A return-delimited list of the form FontName=PostScriptName. Location Authorization Type - The type of location authorization to be used in the app. Either "Always" or "When in use". Requirements and Restrictions - Determines which iOS features are required or prohibited. These options determine what facilities the application requires or prohibits on the device in order to be launched (UIRequiredDeviceCapabilities). Icons - The icon files to be used on different devices. The icon files must be the correct resolution for the device. Splash Screens - The image files to be used as splash screens on different devices. The images must be the correct resolution and orientation. This section allows you to set the Android specific settings for your standalone. Build for Android - Check to build a standalone for Android. Label - The string to display as the label of the application on the Launcher screen. Identifier - The unique identifier to use for the application, using the standard reverse domain name convention. Version Name - A human readable version string for the application. Version Code - An integer indicating the version of the application – this is used by the OS to compare versions of packages as opposed to the human readable string. Icon - The PNG image file to use as the icon on the Launcher. Splash - The image file to use in the personal and educational splash screens (this is not used when building with a commercial license). Signing - Whether APKs are to be signed with the development key, a custom key or no key (this is only used when using ‘Save as Standalone application’). Key - The key-store file to use to sign the application when “Sign with my key” is selected at step 7 (this is only used when using ‘Save as Standalone application’). Status Bar Icon - The icon to be used in the status bar. This must be a png image. Hardware Accelerated - Hardware acceleration is necessary to play videos in the Native Browser. However, it causes a general screen update slowdown. Initial Orientation - The initial orientation to start the application up in. Status Bar - The initial visibility of the status bar. In App Purchasing - Check to enable In App Purchasing. Store - Select the store to use, either Google or Samsung. Minimum Android Version - The minimum Android version required by the application. Android features - The features that should be added to the manifest. A required feature will only be visible to users who have devices that support the feature. A used feature will indicate to the user that this application uses the feature. A used feature will still be visible to devices which do not support the feature. Application Permissions - The permissions to be added to the manifest. Internet is required if your app is accessing the internet. Camera is required if your app is using any camera features. Read contacts is required to read from the phone contacts. Write contacts is required to write to the phone contacts. Vibration is required to use the vibrate action of the phone. Idle timer is required to allow the device to dim the screen and eventually lock the device after periods of no user interaction. Ad Support is required if your app uses ads. 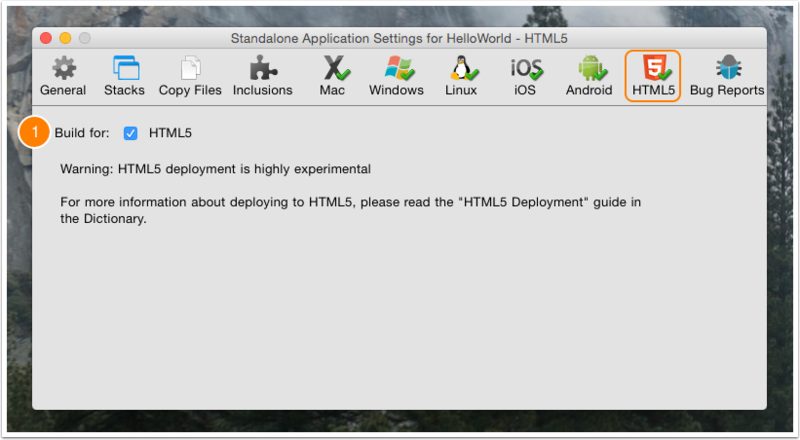 Build for HTML5 - Check to build an HTML5 standalone. Include Error Reporting Dialog - Include an error reporting stack in your standalone. You should select this option if you are testing your application and want details of any errors in your standalone, or if you have not included your own error reporting routines in your stacks. HTMLText for dialog - The text to display to the user in the dialog that comes up when an error is encountered. This text should be in LiveCode-compatible HTML format. Create and format the text in a LiveCode field then copy the field's HTMLText property. Dialog icon - The icon to display in the error dialog. This should be stored as an image in your stack. Allow user to enter comments - Display a box for the user to give you more information. This information will be included in the report. Allow user to save report to file - Allow the user to save the report to a file. Select this option if you want users to save an error report and send it to you. Allow user to email report - Allow the user to email the report. Select this option if you want the user to be able to send you or your technical support department details of the error. This option loads up the system default email client and populates the email with the contents of the error report and the user's comments. The To: field is sent to the email address specified in the email address field. This appears to be similar to the User Guide documentation.Wondered if there is there any more detailed help about the options? In particular I'm currently looking at Copy Files pane and would like some clarification on paths, file locations and how the Copy Referenced Files option works. Thank you. Hi Jim1001, we don't have any other documentation but I'll do my best to answer you here. Any files you include here will be included in your standalone, where the files are stored depends on the platform but you can use specialFolderPath("resources") to get the location of any included resources. This will return the correct resources folder for the platform the app is running on. If you include any folders, or files that are inside folders, the folder will also be created in the resources folder, so the relative path in the app bundle will be the same as the relative path in the Copy Files pane. The "Copy Referenced Files" options loops across every referenced file on your stack (images, players etc) and includes the referenced file in the standalone. These files will all be added at the top level of the resources folder . I hope that helps, please let us know if you have any other questions. Is there a way to alter the standalone application settings by script? Especially version data (which is set in several fields) would be time-saving to be able to set by script, and not manually. set the customPropertySet of this stack to "cRevStandaloneSettings"
Can a script read the App version? In other words in the "About" message of my mobile App I would like to show the stand alone version of that particular build, not the LC version. Can I do that? How? This gets the value set in the Standalone Settings and stores it as a custom property the standalone can access. 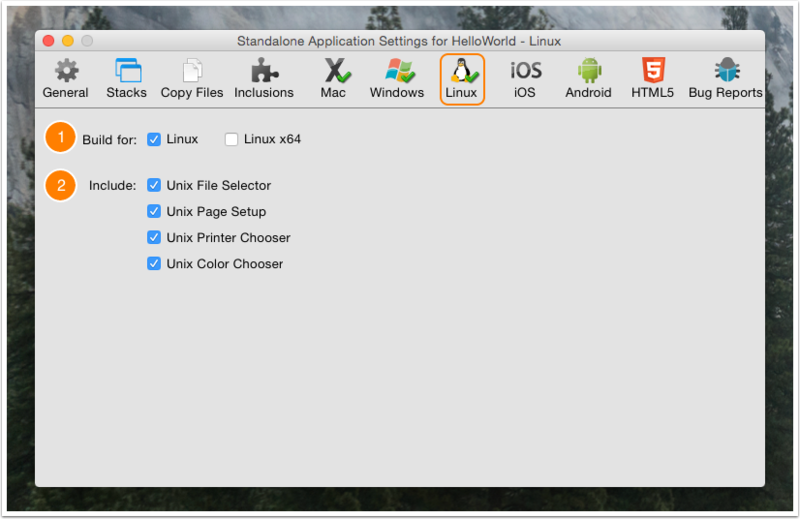 The savingStandalone message is sent when a standalone is built so changing the value in the Standalone Application Settings will cause the custom property to be automatically updated when a new standalone is built without any additional work for you. You can see all the standalone properties by opening the Stack Inspector, selecting the Custom Properties pane and changing the set to cRevStandaloneSettings. Many thanks Elanor this is very helpful.